Now lovers of Cajun cooking can have their gumbo and eat it too! The recipes in this cookbook cover a tremendous range from standard American favorites like pizza, (mock) mashed potatoes, and meatloaf, to classic Cajun dishes including étouffée, shrimp au gratin, and even jambalaya. This book includes suggestions for parties, additional uses for recipes, serving suggestions, and more. This book proves that Cajun cooking can be low-carb cooking. In his travels across the country as a cooking school teacher and food professional, Jude Theriot has heard two things loud and clear from his public—they want more Cajun cooking, and they want recipes that are easy to use and quick! Theriot has responded to this call with a new and unique approach to cooking Cajun style in Cajun Quick. Hardcover. Chef Bev Shaffer dishes up another “to die for!” culinary adventure with this celebration of all things cake. Hundreds of mouth-watering, eye-popping Layered Cakes, Baby Cakes, Cheesecakes, Coffee Cakes, Snack Cakes, and more fill the pages of this ultimate home-baker’s resource. In her signature uncomplicated style, Shaffer serves up slices of advice throughout, from how to avoid a mess when filling a Bundt pan to tips about icing layer cakes and everything in between. Here’s a sure-fire plan for successful dining. Take California’s bountiful food producers and ask for the best recipes for their favorite crops. Combine them with brilliant photos and interesting stories of the farms and their owners, and you have a masterpiece of fresh and wholesome foods. Hardcover. Celebrate your inner hunter’s love of meat with these delicious, practical recipes. From domesticated meats, such as beef and pork, to seafood to more exotic game, including caribou and alligator, enjoy the natural bounty that can be found in the wild. Relish such savory and exciting offerings as Crab-Crusted Grouper or Deep-Fried Turkey. Take a walk on the wild side with Baked Armadillo, Dixieland Fried Frog, and Iguana Stew. From favorite old-style offerings to new and unusual tastes, learn the recipes and techniques needed to bring out the flavor of these meats. Rich in history and even richer in taste, the desserts in this Pelican Classic cookbook are sure to tingle the taste buds and add that special touch to every type of dinner and party. From Cordavi Restaurant’s Roasted Plum Cobbler to the Square Onion Café’s Silver Moon Caramel Cake, this first-class cookbook also serves as a restaurant guide with photographs, history, and stories accompanying the award-winning recipes. Author Janice Shay includes priceless knowledge about the Charleston area and trivia about each of the restaurants featured in the book. RodnReel.com is the largest online fish and game organization in the United States. Its members are a community of avid sportsmen and women who have shared information about camp sites, hunting gear, fishing equipment, and all the tips and tricks of their favorite sport. In this outdoor cookbook, they share the end result: the meal. A Contributor’s Bio introduces readers to the chefs in a personal manner. People have come from all over to enjoy the marshes, woods, and swamplands and to share the recipes they have spent lifetimes perfecting. America’s top chefs are serving up the perfect recipes for the refined tastes of gourmet dining—and they’re good for you as well. Inside The Chefs’ Healthy Collection are more than 150 tasty recipes from the nation’s top restaurants, all of which are remarkably healthy, containing less than 500 calories each. Cajun cooking, which originated in South Louisiana’s bayou country, is hot and spicy and relies on easy-to-acquire ingredients. Creole food has a more citified style and developed in the Creole kitchens of New Orleans. Restaurants in Louisiana have developed a style of their own, at times combining Cajun and Creole influences to produce “Louisiana Cooking,” a truly original cuisine that relies on spicy sauces, fresh produce and seafood, and thick gravies. Paperback. This guide to the Chesapeake Bay crab culture includes dozens of recipes, a history of Bay crabs, and illustrated instructions on buying and cleaning the popular crustacean. As the main ingredient in chowders, pastas, and appetizers, the taste of blue crab is part of life in the Chesapeake Bay area, a region steeped in crab culture. Home to the oldest commercial fishing industries in the country, it provides approximately one-third of the crabs consumed in the United States. Dark, white, bittersweet, milk, Dutch-process, unsweetened—chocolate in all its guises is celebrated in this delicious compilation of recipes by award-winning chef Bev Shaffer. She provides an exhaustive introduction to the basics of chocolate: how to recognize good chocolate, temper chocolate, melt chocolate (using several methods), and even chop chocolate. This cookbook provides a thorough explanation of the language of chocolate that will make even the novice a chocolate expert. The ticket to a healthier you is natural, unprocessed food, but the effort and cost of cooking a nutritious meal every night can be overwhelming. Now, there’s a solution using the most overlooked tool in your kitchen: the freezer. This collection of simple, easy-to-follow recipes uses flavorful, budget-friendly ingredients to make your family healthier, happier, and stress-free. Dishes for breakfast, lunch, dinner, snacks, and desserts take minutes to prepare after being taken out of the freezer. Dairy- and gluten-free variations round out this new staple of every kitchen. Colorful Louisiana Cuisine in Black and White captures the essence of the unique blends that give Louisiana cooking its distinct taste. The combined effort of two Louisianans, one a descendant of slaves and the other a descendant of a plantation family who owned slaves, this edition includes more than six hundred delicious recipes from families that “set a good table.” Hardcover. 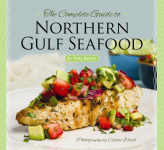 This cookbook provides recipes for every edible species of fish and shellfish found from Tampa Bay, Florida, to Mexico. They range from quick and easy to gourmet preparations. From catfish to snapper to shark, there are recipes for every palate and techniques for every level of experience in the kitchen.